Turkey on Friday “harshly” condemned Israel's attacks on “defenseless Palestinian civilians,” the presidential spokesman said on Friday. At least 14 Palestinians were martyred and 1,500 others were injured in Israel’s attacks on Friday's peaceful demonstrations. A Palestinian farmer was also martyred earlier when an Israeli artillery shell struck his land in the southern Gaza Strip. “We harshly condemn Israel’s attack on defenseless Palestinian civilians who attended the peaceful demonstrations in Gaza today,” Kalin said in a written statement. 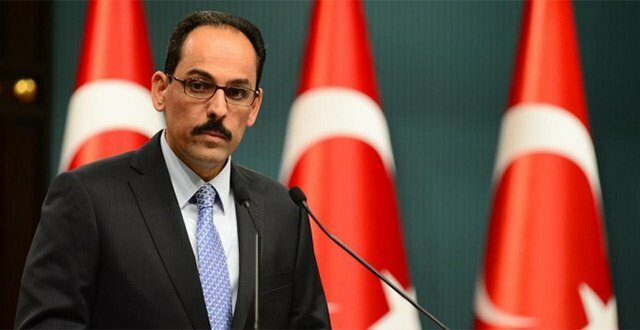 The Turkish presidential spokesman said that it is “impossible” to accept the loss of lives, injuries, the violation of human dignity and the violation of international law in the region. "The gradually increasing systematic violence against the Palestinian people has to end immediately,” he added. “We call on the international community, especially the United Nations to take action,” he added. Additionally, Kalin extended Turkey's solidarity with the Palestinian people. Since Friday morning, tens of thousands of Gazans have converged on the strip’s roughly 45-kilometer-long eastern border with Israel to reaffirm their right to return to their ancestral homes in historical Palestine. Israel has reportedly deployed thousands of troops along the border in anticipation of Friday’s mass demonstrations. Dubbed the “Great Return March”, the demonstrations are also intended to pressure Israel to lift its decade-long blockade of Gaza. The rallies have been endorsed by virtually all Palestinian political factions, which have repeatedly stressed the event’s peaceful nature. Since 2007, the Gaza Strip has suffered from a crippling Israeli/Egyptian blockade that has gutted its economy and deprived its more than 2 million inhabitants of many vital commodities.